Follow the instructions below to check the system software version. 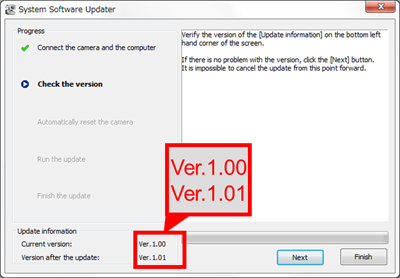 If the system software version is Ver.1.01, the update is not required. Press the UP button or DOWN button to select [MENU] - [SETUP] - [Ver. ], then press the REC/ENTER button. Use a fully charged rechargeable battery pack NP-BX1. The file [Update_HDRAS50V101.exe] file will start downloading. Double-click the [Update_HDRAS50V101.exe] file you downloaded. Do not connect the camera at this point. 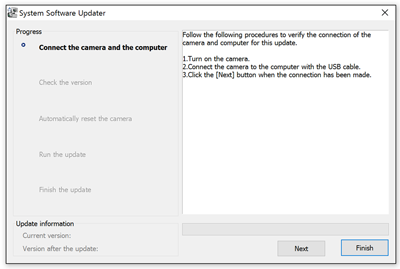 According to the instruction on the System Software Updater window, connect the camera to the computer with the supplied USB cable. 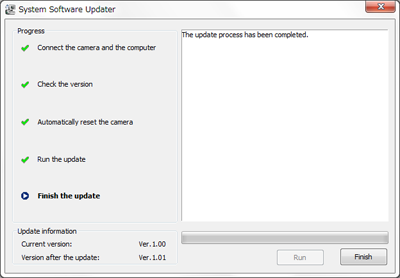 After confirming the above, click Next on System Software Updater. At the same time the message "Follow computer instructions" will appear on the LCD screen of the camera. 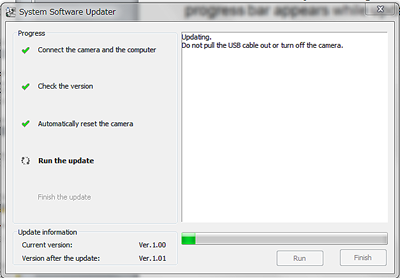 - From this point don't turn off the camera until the system software update is completed. After automatically resetting, the screen below appears. The progress bar appears while updating (approximately 15 minutes). Once the update is complete, the screen below will be shown. The camera will automatically reboot, which may take a few minutes. 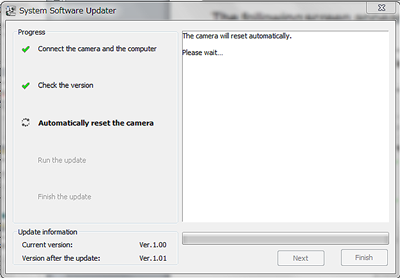 Please wait until the camera's LCD shows the same screen that appeared before starting the software update. When the screen appears, press the [Finish] button and disconnect the USB cable. 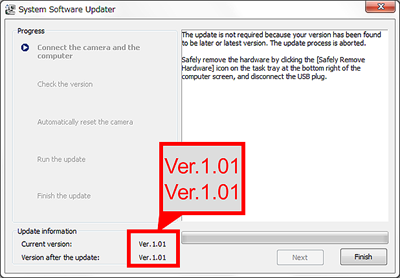 Step 2: Confirm the system software version of your device is Ver.1.01.